This is my FAVORITE Chinese restaurant for Lobster! My Goodness! I can die and be happy after eating the lobster here. I always come here to shell out loads of dough to eat the delicious lobster. Trust me! It is worth every penny. They are a cash only place so be prepared. The lobster is about $16 a lb., so it can be quite hefty as they usually start at 3-4 lbs. I can eat a 5 lb. by myself if I have to, or if I had the money! Be sure to order the lobster with their special lobster sauce, I believe the Newport Seafood Special Lobster. I am drooling as I think about it. The sauce is infused inside the lobster and decked out everywhere on the plate. Every time I have gone, the lobster was tender and juicy. The service is actually pretty good because they often come by to change plates and give you more napkins. Like most Asian restaurants, they start out by giving you a cup of Hot & Sour soup. Another thing I love is their drinks. I LOVE Durian! So I always order 1-2 durian shakes. Be forewarned, if you don't know what durian is... you might not want to risk trying it. Most people either love it or hate it, especially since it has a stinky smell. 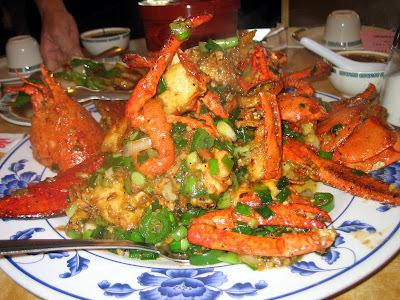 I usually go for lunch because Chinese food is sooo much cheaper at lunch, hence more money for the lobster! I ordered the Fried Whole Fish with the Thai/Vietnamese Sweet & Sour sauce. The portions are generous because you get a whole fish. It was fried to perfection and easy to pull off the meat from the bones. My friends ordered Shrimp with Black Bean Sauce, Fried Tofu, & Ma Pao Tofu. Of course all this is family style, so we share. I thought the shrimp was only okay, not the best black bean sauce I have had. The fried tofu was good, how can you ever go wrong with fried food! Although I don't think that was on the menu so it ended up being like $9. I was like OMG, I would never order it for that much. Word to the wise, when it is lunch you should order off their lunch menu because it is a MUCH better deal. My other friend decided she had to have crab. So she ordered the Newport Seafood Special Crab. It was good but NOTHING compared to the lobster. For some reason the sauce truly brings out the flavor of the lobster! The crab was decent but for the amount you spend, I'd rather pay a little more and order the lobster. One week later, I went back with a friend for lunch and ordered what I normally get. I got the Fried Fish Fillet in Basil Sauce. As you can see, I come back to this place a LOT. It is really cheap and good. Since I just got back from another trip, I decided I shouldn't splurge and order a lobster. Although I always regret it when I don't get my favorite dish! My friend ordered the Salt & Peppered Pork Chops. Very typical Chinese dish, but good as always. Like I have said, you can't go wrong with fried food. Especially when it is not a gross thick batter that absorbs the oil. Definitely come and try this place. Be aware that they are SUPER packed on weekends. I have gone at 8:30pm and waited an hour for a table. My mouth is watering from looking at the Lobster and Crab pictures! YUMMY! So how do I know or find any of the places you review? 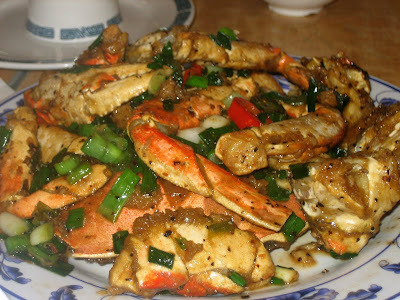 This Newport Tan Cang Seafood Restaurant is not in Arcadia. Sorry Tim, I get confused what city I am in sometimes since the line is pretty close. I updated the info and addy to make sure everyone can find it. The new location is bigger and now they accept credit cards!!! YAY!